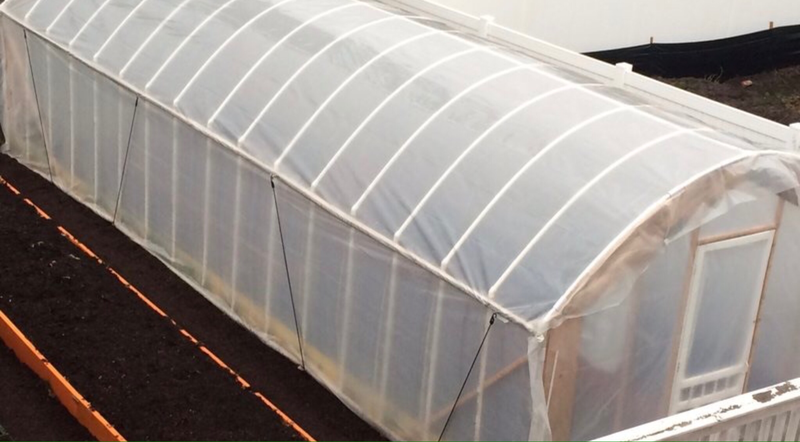 ELMHURST – A collective sigh of relief was felt throughout Elmhurst last week as an administrative judge ordered a local family to remove their unsightly backyard membrane structure (commonly referred to as a “hoop house” and bearing no aesthetic value whatsoever) by the end of February, or face fines from the city. Rising a couple of feet above every privacy fence in the neighborhood and constructed primarily with plain one-inch PVC piping and HDX six-millimeter polyethylene clear plastic sheeting typically used by painters and axe murderers, the now-famous hoop house built by Fairview resident Nicole Virgil and her family for the purpose of gardening during the winter left many citizens wondering over the last several weeks if the backyards throughout their town would eventually resemble “Tijuana junkyards” had the city upheld its unofficially-official stance on the subject, which inexplicably allowed the ghastly 12 x 20 foot atrocity to exist over the previous two winters. Residents who live closer to the Virgils’ home echoed what the overwhelming majority of Elmhurst residents feel about the hoop house. In addition to the dreadful sight of the structure – which one neighbor reports is 100% visible from both her deck and her bedroom terrace – Elmhurst residents have also accused the Virgils of using their winter harvest in a lucrative summer business called “Fairfield Produce”, where their children are forced to sell vegetables from the front yard for two full hours each and every Saturday morning from June through August. “I’ve had to wait a couple of times while the kids try to figure out how much change I have coming back to me when I drop down a hundred dollar bill for six bucks worth of kale,” said Brendon Cooper, who added that he only shops at Fairview Produce because it’s easier to keep an eye on his Range Rover when he’s away from the vehicle. “If they’re struggling with that, then you know their parents are skimming off the top of the kitty. Where is that money going?”. The Virgils are reportedly exploring all other options before surrendering to the city and removing the hoop house. Self-reliance is apparently horrifying to city governments which work for the chambers of commerce (and that’s pretty well ALL of them). Really Dave Noble? Most people probably have not been in Tijuana? How would you compare this to a Tijuana junkyard??? How dramatic Lol!!!! I agree they probably haven’t LOL. But “Tijuana junkyard” is in quotes in the story, implying that someone else said it, not me. In fact, Nicole Virgil told me herself that someone compared her backyard to that. So..a family wants to reduce dependence on stores, as well as save money by growing their own, avoid poisonous gmo produce and this is how they are treated. Fascism.